If you could narrow down Dhaka's transportation problems to one source, what would it be? Well that's a really tough question to start off with since there really isn't one single problem that is ailing Dhaka. But if I had to narrow it down, it would have to be the total lack of any efficient public transport system. Mind you, we do have some sort of public transport, it's just very inefficient. By an efficient transport system, I mean one that utilises the most street space available, and has an organised system of running and operating. If you only take an hour-long trip around Dhaka, you will see that most of the public buses and transport we have are ancient, and are meant for the Dhaka of old where population and street space were both pretty small. They also run without any kind of deference to either pedestrians or other forms of transport around them. They are also incapable of existing in the current space as roads are occupied by vehicles that are either slow-moving or faster than them. Hence, there's a total mismatch of transportation modes that exist in the same streets. And I stressed on the public part and not merely on general transport because even if you are middle class in Dhaka, you already have a car or a motorbike. It's the people from the lower spectrum who are reliant on public transport and who have no other recourse. These are the people who are more in numbers and who need help immediately. Digital Bangladesh has been the rallying cry of the present government leading up to the elections. To what extent do you think Dhaka's traffic problems could be solved by technology? I am a firm advocate of mass railway transit (MRT) for some very obvious reasons. One is something that I already spoke about before: efficiency. The MRT can give you higher capacity and much higher speeds that are not available by any other road transport in Dhaka. Its nearest rival is the underground system which will be much more expensive relatively speaking. Besides, it's structurally very difficult to have an underground system which will use electricity every single minute of the day and also can become a breeding ground for criminal activity. It's both cost effective and practical to have an above- ground system and this is where the MRT comes in. Compared to an underground system, the MRT will have 2.5 times more capacity: it can involve around 80,000 people per hour per direction. It can also be readily adjustable to suit either the peak hour or holiday traffic by easily adjusting the number of bogeys. JICA has already done a feasibility study on a route from Pallabi to Jatrabari, and the results have been very positive. I am also a big fan of double-decker CNG-run public buses and we are seeing this more and more on the Dhaka streets. Dhaka's traffic problem isn't anything new. In fact, donors have thrown millions of dollars at the problem to no avail. Historically, what has been the main impediment in getting money to lead to results? You're absolutely right, money has never been the problem. Every government that has come in has been given a lot of donor money to fix the traffic problem. In fact, unlike other sectors, donors usually did not attach any strings with the money. Unfortunately, like almost all the problems of Bangladesh, there has been a serious lack of political will to fight to fight the traffic problem: politicians talk the talk, but they don't walk the walk. Dhaka till very recently was known as the city of rivers, although that depiction sounds very dated now. How important do you think is getting our networks of rivers and canals back on track to the overall traffic situation of Dhaka? If we look at neighbouring cities like Bangkok, for example, they have had the same problems. The long term, more sustainable solution is of course to bring industrialisation under control and slowly get rid of pollution from the rivers and canals. But this will take time and a lot of concentrated effort on the part of many different stakeholders. What we could do meanwhile is introduce a set of high-speed boats and speedboats to immediately alleviate the problems that commuters face while travelling on these rivers and canals. These boats will also have to be coordinated with road transport on the banks of rivers and canals since otherwise passengers will be stuck. What we need is coordination between land and river transport systems that will help smooth the flow of traffic between water and land based transports. Till now, that link is missing. Rapid economic development is sometimes blamed for Dhaka's traffic woes. Do we have to compromise on Dhaka's growth rates to improve the traffic situation or can we have our cake and eat it too? I don't think there is a trade-off between economic growth and sustainability. Dhaka can certainly keep on growing but what we need is harnessed growth as opposed to uncontrolled growth. To put in another way, there is not precedence in Dhaka where growth poles have been planned and distributed around the city and outside. There are two ways of going about distributing urbanisation: one is to have satellite cities built around Dhaka, while the other option would be to manage growth within Dhaka so that it is sustainable. I personally tend to side with building satellite cities around Dhaka since that is the best option for the long run. There is serious scarcity of land in Bangladesh and when I see satellite towns like Gazipur and Tangail, which have so much potential, being really mismanaged, it really hurts me. What city planning in Dhaka totally lacks is a better idea of what satellite cities can offer. Take Gazipur, for instance. It can easily be the home of so many garment factories that are popping up all over Dhaka. Yet our planners provide no incentive for factories to move out of Dhaka and into Gazipur. Yet again, everything revolves around public transport. 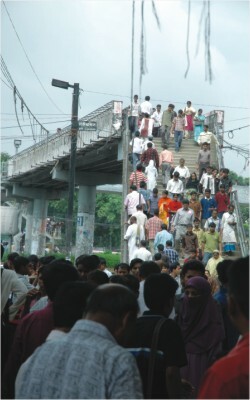 If workers had access to efficient public transport to and from Dhaka, they would easily be induced to live in the outskirts of Dhaka, and not in Dhaka. That alone accounts for at least 10 per cent of Dhaka's population. Once the factories begin to realise that they have the same access to cheap and skilled labour outside of Dhaka, they have a serious incentive to move out of Dhaka. All the tax breaks in the world will not budge factories out of Dhaka if labour costs rise up or access to labour becomes difficult, since it is ultimately labour that gives our garment factories comparative advantage. Thus, this is a perfect example of growth not being stopped, but merely redirected. I don't have to be a pessimist to think the future looking bleak for Dhaka in the next decade or so. Briefly, what would be some good short- and long-term solutions that could be adapted by the various stakeholders? The simple fact is congestion and traffic problems haven't been declared a national priority. For decades, politicians have come and gone promising many things, but there have been no delivery. There have been solutions aplenty. The long-term solutions would be to actually make a plan that includes all the stakeholders and not just a cross-section, with donors and government involved. I don't think any government has actually sat down with Dhaka residents themselves and asked them what they want, or what kind of solutions they envisage. Instead, a coterie of "planners" meets with donors and hash out their own solutions. This has to stop. Short-term solutions are also many. The biggest need is to place priority on everyday pedestrians who actually use the city streets. There are absolutely no proper pavements in the city. What kind of message does that send to people? That the only people who can commute in Dhaka are people who have cars? Cars, in fact, have become a problem too. Car parking around the city is atrocious: you can park anywhere in the city as long as you spot a space. Drivers drive and park with impunity, knowing there is no one to stop them. Again, this behaviour is tied in with total lack of competition as far as public transport is concerned. We need more radio taxis, a system of restricted car parking, and effective traffic management. These are all doable in the short run. 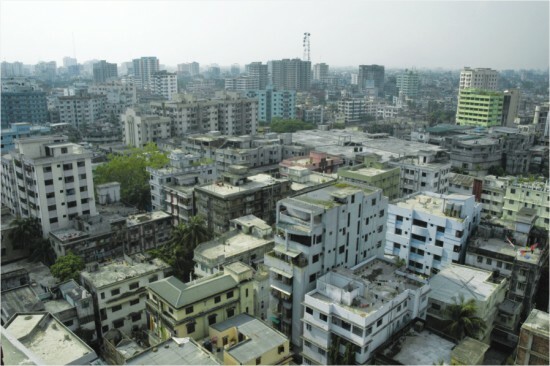 Dhaka residents are often blamed for not feeling a sense of ownership or pride for their city. How do we cultivate a change in behavioral trends and establish a different mindset that would gear residents towards feeling a sense of kinship and personal accountability towards their city? I don't blame Dhaka residents for feeling apathy. When was the last time anyone in power had a consultation with the common person? We do not feel empowered in the city, nor de we feel we are part of the city. There is a clear gap between those who decide and those who follow and unless this is resolved, there will never be any sense of community within Dhaka. Dr. M. Rahmatullah is the Policy Advisor for Transport Sector Management Reform of the Planning Commission.